1. Preheat the oven to 190°C, gas mark 5. Heat the oil in a large frying pan and cook the onion and garlic for 5 minutes. Stir in the fennel and rosemary and cook for a further 2 - 3 minutes until the onions are softened and golden. 2. Meanwhile, whizz the bread into coarse crumbs and tip into a large bowl. Add the sausage meat, peppers, egg and fried onion mixture. Using hands, bring the mixture together until well blended. 3. Shape firmly into 12 even-sized balls. 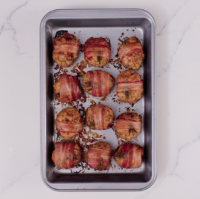 Wrap each one in a piece of bacon and tuck a small sprig or rosemary into each. Sit the balls, join-side down on a small baking tray or shallow roasting tin. Cover with foil and bake for 30 minutes. 4. Remove the foil and cook for a further 15 minutes until the bacon is crisp and the balls are completely cooked through.